So we've been watching this documentary on netflix called "Ancient Aliens"
So we wrote a song about them. It's called "White Blue Super Giant"
Sorry about the long stretch without any updates, everyone! We keep starting projects that we don't finish, so we haven't had anything new to post. We have a couple songs in the making right now, though, so keep an eye out! We just need to polish them up a bit and make videos for 'em now. I just had my birthday last Sunday, and it was met with the worst news ever: My favorite Japanese restaurant (which was only a ten minute drive from my house) had closed for good just a few days before. This saddened me greatly. Where would I get my katsu-don fix?! Even though I grew up in Japan, I've always been really intimidated to even try my hand at Japanese Cuisine, because it seemed so easy to mess up. 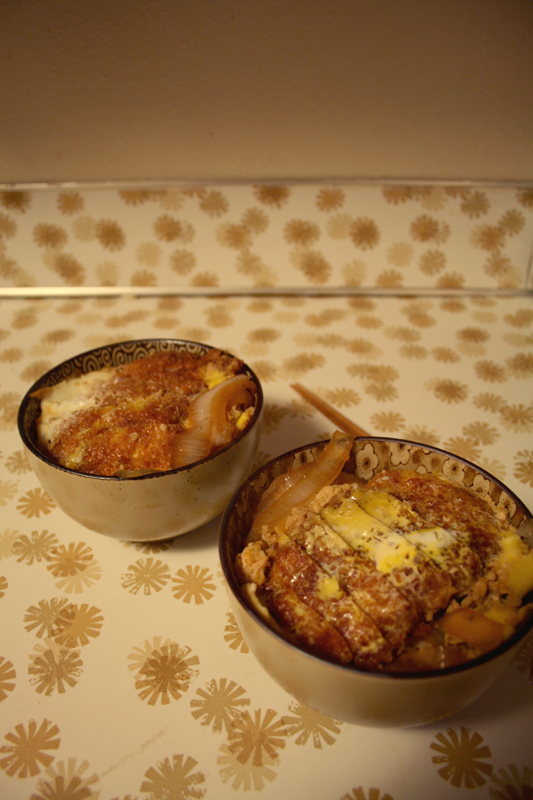 Fortunately for me, Franklin is all about diving into new cooking adventures head-on, and that night, he made me katsu-don. Man oh man oh man. It was perfect. It tasted just like it does in Japan. Sigh! and I've made him make it every night since, haha. -Chop onion into strips. Heat soy sauce, mirin & sake in skillet. Add the chopped up onions and cook until they're nice & soft. -Place the breaded pork cutlets on top of the onions as they simmer with the sauce. Lightly beat the remaining two eggs, and pour on top of the cutlets. Immediately cover with lid, and continue simmering on medium low until the eggs are cooked thoroughly. Sigh! just thinking about it is making me hungry again! Ahhh, I'm gonna get so fat. Anyway, yes! If you've never had katsu don, you're missing out. So try it!!! Oh! also, you can add (and should!) add finely chopped green onions to this, but we didn't have any handy so we went without.